Website Special: Free shipping within the Continental U.S. for the first book. Additional books please add $4.00 for each for S&H. For books purchased outside of the states please email Elisa so that she can tell you how much to add for S&H. MA residents please add: 6.5% sales tax. 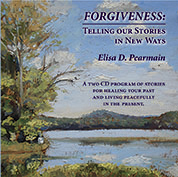 A two CD program of stories for healing your past and living peacefully in the present. Two hours of listening including 16 stories from many traditions, commentary and exercises to help the listener and those they serve to heal from the past and live more joyfully in the present. Winner of the 2015 Storytelling World Award for Storytelling Recordings. CONTINENTAL U.S. ONLY. Outside of the continental U.S. please contact Elisa for the additional price with postage. Lessons from 99 Multicultural Folktales for grades K-8. Winner of the Silver Medal in the Independent Publishers Book Awards for 2009! Outside of the continental U.S. please contact Elisa for the additional price with postage. Character Education Group, Chapel Hill, N.C.
To order from the publisher please visit or call: www.CharacterEducation.com (888) 262-0572 (Toll Free). 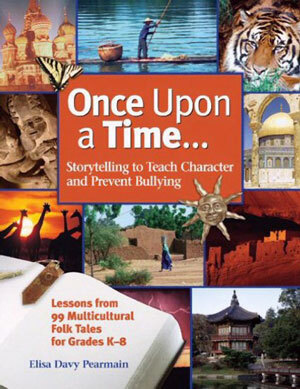 This book features 99 folk tales from around the world addressing 12 character traits: Cooperation, courage, diversity appreciation, empathy, friendship, generosity, honesty, leadership, respect, responsibility, perseverance, self-control, and there is a chapter on bullying prevention. There are follow-up suggestions for teachers and parents after each story. There is also extensive information for teachers on how to tell stories effectively in the classroom and how to help your students to be effective storytellers. "Your book of collected stories and helpful suggestions for teachers is something that we will turn to again and again. I love the way the book includes an index of stories by theme as well as by title. Thanks again for everything!" Jeanine Nostrame, Principal, Ridge Ranch Elementary, Paramus, NJ. "We use this book as the central text in our graduate degree class, 'Storytelling and Character Education', at Southern CT State University in New Haven, CT. It is a universally loved book by our students, mostly teachers and librarians getting advanced degree credits. They all report using the stories and activities from the book in their classroom and work situations, and many of them have said they have found it to be the most useful text of their entire graduate program. and all are directly on point to the subject at hand." for that age group - should be without this book." Winner of the 1999 Storytelling World Honor Award for Anthologies. (3rd Printing). (1998) Formerly Pilgrim Press. Reprinted in 2007 by Wipf & Stock. Doorways is an excellent resource for middle school teachers, librarians, families, religious educators, ministers, and anyone in the healing professions who wishes to use stories as an educational or therapeutic tool. While written for adults, many elementary and middle school teachers and parents report using the book regularly in their classrooms and homes. Doorways to the Soul features 52 short wisdom tales (mostly folk tales), from many of the world's spiritual traditions and cultures. Following each story Elisa has written suggestions to help the reader to make a deep and lasting connection to the story. She suggests that readers take in the stories one at a time, reading one per week, to give it time to digest, and become a part of the psyche. Most readers report that they read the all the way through in a short time and then go back and do as she has suggested. 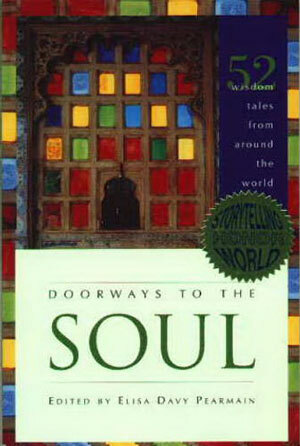 "Thank you for your book, Doorways to the Soul. My partner and I are going through very hard times with things that are out of our control. He reads me your stories while I cook, and we answer the questions. It is a handrail to hold on to in these very hard times. Thank you." "A lovely collection of short tales from different spiritual traditions." College freshman are often lost in finding direction. I needed to find a book to help them in their search. Elisa Pearmain's Doorways to the Soul: Fifty-two Wisdom Tales from around the World is the text I was searching for in helping these youth. It is a rich tapestry of instruction in the form of tales. It uses the stories of old to guide the decisions of today. Whether you are a college professor, teacher, a parent, student, or community organizer this is the book I keep near me and it is one that you want by your side as well. This website, its contents, and all materials herein are copyright ©Elisa Pearmain/Wisdom Tales. All rights reserved.